These days i'm cooking from a very lovely book called "Cooking at Home with Pedatha". I am loving it. Its one of the best vegetarian cooking book i have come across in a very long time. And one very unique chutney recipe i came a cross is Carrot Pachadi. For paste ,soak the chillies and mustard in 1 cup water 3-4 hours . Strain and grind to fine paste using as little strained water as possible. In a khadai , heat the oil for tempering. Pop the mustard and then add the fenugreek. Switch off the flame and with the browning of the fenugreek add the hing. Add carrot , lemon juice ,the paste. Store in clean airtight container in refrigerator, tastes best after a day or two. 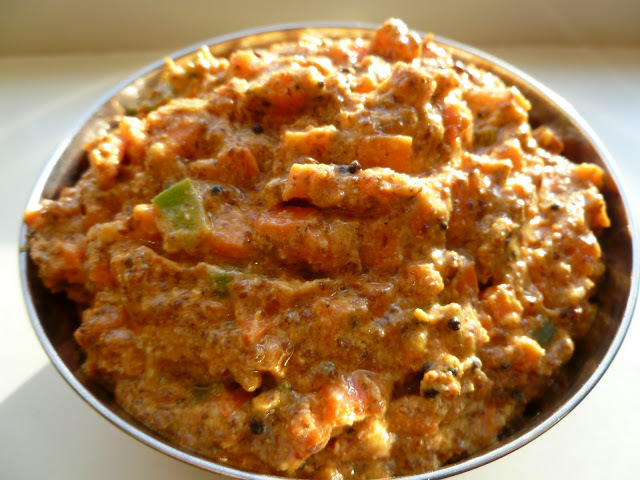 Carrot pachadi looks spicy and delicious..
OOO,that looks spicy and to yearn for....yum yum. Looks amazing!! Love the flavours. This is just like Sindhi carrot pickle.